The University of Maryland's men basketball team is headed to the NCAA Tournament. COLLEGE PARK, Md. — The University of Maryland's men basketball team is headed to the NCAA Tournament. On Sunday it was announced the Terps would be the sixth seed in the East Region. Their first game will be held in Jacksonville, Florida on March 21 against the winner of Belmont and Temple, who play Tuesday for the eleventh seed. This year marks the Terps first appearance in the East Regional since their National Championship season in 2002. They come into the tournament ranked 21st by the Associated Press, with a 22-10 record. Over the last 24 years, the Terps have made eight Sweet Sixteen's and two Final Four's which came consecutively in 2001 and 2004. Their overall NCAA Tournament record is 41-26. 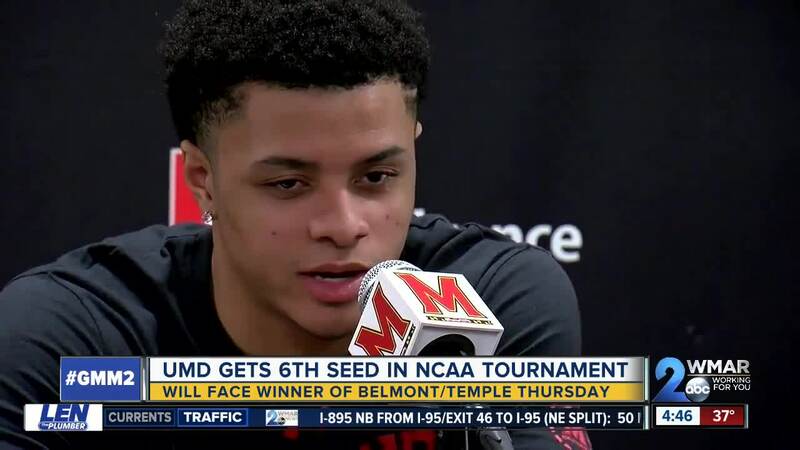 While the Terps have never played against Belmont, they're 4-6 all time against Temple. In the event they win their first contest, the Terps would square off against the winner of Louisiana State and Yale.